Welcome to This Date in Aviation History, getting of you caught up on milestones, important historical events and people in aviation from October 3 through October 5. October 4, 1957 – The launch of Sputnik 1. The eighteen-month period from July 1, 1957 to December 31, 1958 was celebrated as the International Geophysical Year (IGY). Sixty-seven countries (but not China, who chose not to participate in protest of the inclusion of Taiwan) attempted to transcend the political and cultural divides of the Cold War and come together in the name of science. The ideological adversaries worked on projects that covered 11 Earth sciences, including ionospheric physics and other investigations into the near space around our planet. Despite the amicable intentions of the IGY, the Soviet Union saw the event as the perfect opportunity to make a Cold War propaganda statement by launching the world’s first artificial satellite into space, Sputnik 1 (Sputnik simply means satellite). For a generation brought up on stories of space adventure and the marvels of science fiction, Sputnik was science reality, and the American public was dismayed that the Russians had beaten the US into space. Sputnik 1 was launched into orbit from what is now known as the Baikonur Cosmodrome in Kazakhstan atop the Sputnik rocket, which the Soviets derived from the world’s first intercontinental ballistic missile (ICBM), the R-7 Semyorka. At just 24 inches in diameter, the diminutive satellite trailed four antennas placed equally around the satellite so that it could transmit to Earth from any position in its axial rotation. As the satellite circled the Earth, it emitted radio pulses that could be tracked by amateur radio operators on the ground the world over, serving as a constant reminder that the Soviets were directly overhead. Sputnik 1 could also be seen from the Earth, and observers who turned their binoculars or telescopes skyward could watch the Russian satellite as it passed overhead. But Sputnik 1 was not just a Soviet propaganda tool. The satellite also performed some useful scientific experiments as it moved through the edge of space. The drag it experienced helped to ascertain the density of the upper atmosphere, and the radio signals sent back to Earth provided useful information about the ionosphere. These radio signals lasted for just 21 days before the three silver-zinc batteries ran out, and Sputnik 1 burned up on re-entry into the Earth’s atmosphere on January 4, 1958, just three days after the US launched their own satellite, Explorer 1. However, the Americans only managed a third place finish in the first heat of the Space Race, as the Russians had launched Sputnik 2 in two months earlier. An envelope and postage stamp mark the fifth anniversary of the launch of Sputnik 1. Despite the intention of the IGY to bring nations together, the launch of Sputnik 1 also marked the beginning of the Space Race, an entirely new competition between East and West, with America seemingly always one step behind. It was not until the Apollo program put a man on the Moon on July 24, 1969 that the Americans finally gained the upper hand. In the face of this momentum achievement, the Russians simply shrugged and said they never wanted to go to the Moon anyway, though they had certainly tried. Instead, the Soviet space program focused its efforts on long endurance missions in orbiting space stations. October 3, 1985 – The first flight of the Space Shuttle Atlantis, the fourth of five Space Shuttles produced. Atlantis was also the last Shuttle to launch into orbit on STS-135, July 8, 2011, after the cancelation of the Space Shuttle Program. The orbiter’s first mission, STS-51-J, launched on October 3, 1987, and delivered a classified Department of Defense payload to orbit before returning to Earth four days later. Over the course of 33 flights, Atlantis racked up 4,848 orbits of the Earth, flew nearly 126 million miles, carried 156 different astronauts to space, and performed the fourth and final servicing mission to the Hubble Space Telescope. Atlantis is now on display at the Kennedy Space Center Visitor Complex in Florida. October 3, 1943 – The first launch of the V-2 rocket, a gyroscopically guided “vengeance weapon” developed by German rocket scientist Werner von Braun. The test launch, and many following operational launches, took place from Peenemünde on the island of Usedom in the Baltic Sea. The first rocket traveled just 118 miles, but it was the precursor to more than 1,100 rockets that were fired against England and France beginning in early September 1944. Launched from mobile launchers and reaching speeds of almost 4,000 mph, the rockets were impossible to intercept and caused the deaths of more than 2,700 Britons. Following the war, captured V-2 rockets—and captured German scientists—formed the nucleus of both the American and Russian space programs. October 4, 2004 – The death of Gordon Cooper. Born on March 6, 1927 in Shawnee, Oklahoma, Leroy Gordon “Gordo” Cooper was an aerospace engineer, US Air Force pilot and test pilot, and the youngest of the Mercury Seven, America’s first astronauts. Cooper first flew in space on May 15, 1963 on Mercury-Atlas 9, the sixth and final manned mission of Project Mercury and the final mission in which a single American astronaut was launched into orbit. During the flight, problems with the guidance system required Cooper to fly the Faith 7 capsule manually, and he came down in the ocean just four miles from the recovery fleet. Cooper’s 34-hour flight marked the first time an American had spent more than a day, and slept, in space. In 1965, Cooper returned to space as Command Pilot of Gemini 5 with Pete Conrad, a 191-hour flight that proved astronauts could fly to the Moon and back. Passed over for an Apollo mission, Cooper retired from NASA in 1970, and died of Parkinson’s Disease at age 77. October 4, 1992 – The crash of El Al Flight 1862, a cargo flight from New York’s John F. Kennedy International Airport to Ben Gurion Airport in Israel. After departing from a refueling stop at Amsterdam’s Schiphol Airport, fatigued fuse pins holding the number 3 engine on the Boeing 747-258B/SF (4X-AXG) failed, causing the engine to fall and swing into the number 4 engine. Both engines subsequently departed the aircraft. The pilots attempted to return to Schiphol, but the asymmetric lift caused by the remaining engines on the left wing, combined with a lack of lift from damaged control surfaces on the right wing, led to an uncontrollable spin as the aircraft slowed for landing. 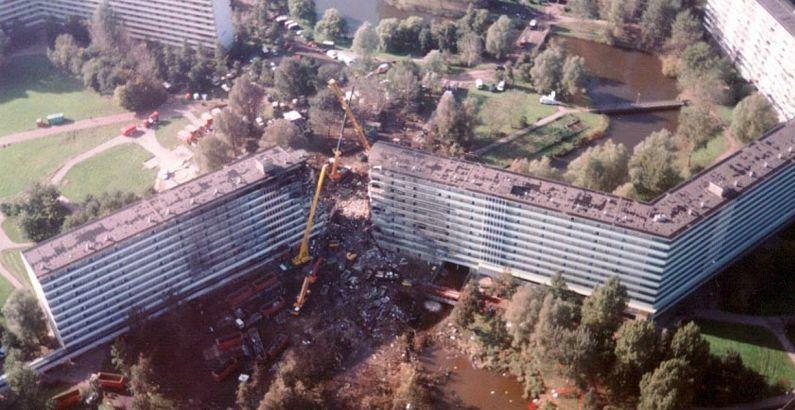 The 747 crashed nose down into an apartment block, causing the deaths of the four crewmembers and 39 on the ground. October 4, 1968 – The first flight of the Tupolev Tu-154, a three-engine narrow-body airliner that served as the mainstay of the Russian flag carrier airline Aeroflot and 17 other nations. Since its introduction in 1972, the Tu-154 has carried 137.5 million passengers a year, half of all civilian passengers flown by Aeroflot. Like many other Soviet aircraft, the Tu-154 was designed to operate from unpaved airfields, and provided service to otherwise unreachable Arctic regions of the Soviet Union. Aeroflot announced the retirement of the Tu-154 in 2010 after almost 40 years of service, and the last scheduled passenger flight took place in May 2015. October 5, 1984 – The launch of Space Shuttle Challenger on STS-41-G. The Space Shuttle program tallied many firsts during its 34 years of spaceflights, not the least of which was the first launch and return of a reusable spacecraft and the flight of Sally Ride, the first American woman in space. But STS-41-G had its own impressive list of firsts, some important, some rather mundane. The main goal of the mission was to deliver the Earth Radiation Budget Satellite into orbit, but Challenger also carried the largest crew of any mission with seven astronauts. It was the first time that two women went to space (Ride and Kathryn Sullivan), and Sullivan was the first woman astronaut to perform a space walk (EVA). Also among the crew were Paul Scully-Power, the first Australian-born astronaut, and Marc Garneau, the first Canadian astronaut. And, topping it off, Scully-Power was the first astronaut with a beard. October 5, 1967 – The first flight of the Shin Meiwa US-1A, a large, amphibious short takeoff and landing (STOL) aircraft developed from the Shin Meiwa PS-1 and used by the Japan Maritime Self-Defense Force for maritime patrol, anti-submarine warfare (ASW) and search and rescue (SAR). The hull of the US-1A is based on a refinement of the the Grumman HU-16 Albatross hull design, and a special boundary layer control system helps to reduce the takeoff distance. In 23 years of service, the US-1A and her crews have reportedly saved 550 lives. October 5, 1918 – The death of Roland Garros. Born on October 6, 1888, Eugène Adrien Roland Georges Garros was a French aviation pioneer who competed in air races and set a world altitude record of 18,410 ft in 1911. During WWI, Garros helped develop a system of bullet deflectors that allowed gunnery through the propeller and, on August 3, 1914, Garros shot down a German Zeppelin, receiving credit for the first aerial victory in history. Garros was shot down and killed just one day short of his 30th birthday, five weeks before the Armistice that ended WWI. Despite his lasting fame, though, Garros was not officially an ace, having downed four aircraft during the war, one short of the five necessary for acedom. October 5, 1914 – The first air-to-air combat victory is recorded when a Voisin III pusher biplane of Escadrille VB24, piloted by Sgt. Joseph Frantz with observer Cpl. Louis Quénault, shot down a German Aviatik B.II over Reims, France. Frantz fired nearly 100 rounds from his Hotchkiss machine gun, while the German observer returned fire with his rifle. After running out of ammunition, the French observer continued firing with his rifle, and the German plane crashed, killing both crewmen.